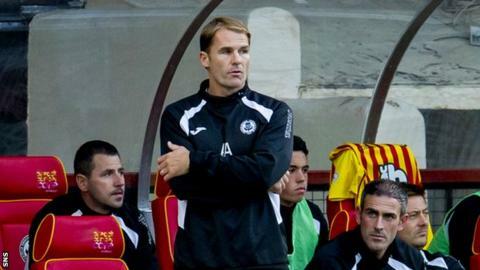 Partick Thistle manager Alan Archibald vented his frustration after conceding the lead against Hamilton with minutes remaining of their match at Firhill. Kallum Higginbotham's 85th-minute strike was cancelled out by Tony Andreu. And two minutes into added time, Jason Scotland fired in to give Hamilton all three points. "If you're winning the game with five minutes to go, we should see the game out," said Archibald. Archibald said the performance from his players was simply not good enough, especially after their good start to the season with a 4-0 win at home against Ross County and a hard-earned draw away to Dundee. "It's very disappointing from our point of view," said Archibald. "I don't think we played well at all. "It's probably down to Hamilton - I think they were the better side. "We got a goal at a good time and we should have had enough to see the game out, but we didn't. "We just didn't turn up today, we didn't pass the ball, we didn't get down and play, I don't think Hamilton let us. "We played into their hands. We were the home side and I thought we should have taken the game by the scruff of the neck. We didn't do enough. "It was a scrappy first half, there was a number of chances created and neither side took them. "From our point of view, we've got to do better - especially with us being the home side, but we lost two very, very bad goals."